After spending her early years in Cairns, Jennie gradually made her way south to Murwillumbah, Sydney and now is almost a local in Albury after settling here in 1988. Jennie enjoyed a broad range of physiotherapy experiences in the public health system in Sydney, Hobart and Albury, followed by 11 successful years as Principal of her own private practice. Since 2004 she has been a committed member of the Flex Out team, and works in the Albury practice four-days a week. Hand therapy and upper limb disorders have been Jennie's area of expertise for more than 24 years. In 2002 she passed an international exam to become a Certified Hand Therapist. 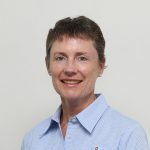 She is an Accredited Hand Therapist (as awarded by the Australian Hand Therapy Association) and has been a member since 1995. Jennie has previously served on the AHTA executive committee and has presented at National AHTA conferences. Jennie also lectures casually in hand therapy at Charles Sturt University. A qualified Lymphoedema therapist, Jennie is currently listed on the National Lymphoedema Practitioners register. Outside of work, Jennie is a very keen and experienced equestrian competitor and chocolate connoisseur. She loves to be outdoors, and lists her most important life achievement as raising three beautiful, happy children.